Join us every January for a one-of-a-kind exhibit, filled with musical splendor and art! Our annual Posters, Pints, and Pies is an art exhibit of private collection music show posters. Hand-selected by local music-lovers, these show posters are curated from private collections and have included Grateful Dead, Phish, Widespread Panic, Drive-By Truckers, Ben Harper, MOE, BB King, Galactic, Jefferson Airplane, The Black Keys, Warren Haynes, Gov’t Mule, Bob Dylan, Sound Tribe Sector Nine, Keller Williams and so many more. Interested in showing a poster of your own? That’s great! Every year, we are looking for new collectors to join our ranks. If you have any questions about this exhibit, please email sarah@karmamanagementinc.com or call 205-322-4386. Click here to enter your poster today! Please create separate entries for each individual poster – once you have completed your first entry, you’ll be prompted with an option to, “Submit another response.” If your poster is selected, you will be comped one ticket to the event. The drop off dates are January 21st & 22nd – We will be open until 5:00 p.m. on the 21st and 6:00 p.m. on the 22nd. Our address is 109 Richard Arrington Jr Blvd South, Birmingham, AL 35233. Please refer to our master list below to see if your poster has been exhibited in previous years. We are looking for new posters each year in order to keep the exhibit fresh! Hanging hardware required to be considered for the exhibit. Click here to view our master list of exhibited posters of the last 3 years! Thanks! 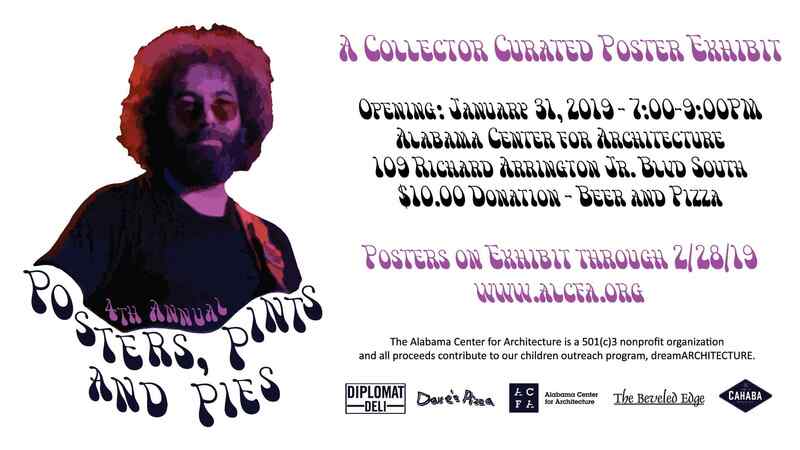 We look forward to seeing your remarkable, private collections for the 4th Annual Posters, Pints & Pies!